Despite recent advances in scientific knowledge and several clinical trials, muscle gene and cell therapies remain a major challenge. As a matter of fact, novel technologies are being developed for targeting muscle tissues including CRISPR, TALEN, and iPS technologies indicating that gene-based therapies still hold significant promises. Recent findings from our laboratory and others unveiled that microRNAs (miRs), small nonprotein-coding RNAs, are able to posttranscriptionally regulate many genes and exert pleiotropic effects in the muscle. Deleterious changes in miR expression play an important role in muscle diseases. 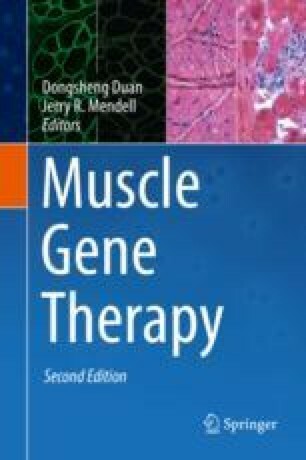 In this regard, miRs are possible therapeutic targets, and miR-based gene therapy for smooth, skeletal, and cardiac muscles is an extremely interesting field for harnessing the complexity of miR-based therapeutic approaches. In this chapter, we will focus on miR-driven regulation of myogenic routes in homeostatic and challenging states. We will also survey the intriguing perspective of miR biological transfers, including the delivery of functional miRs via exosomes that unlike other vectors are cell-free natural systems for ferrying RNAs between cells. Finally, we will review the recent literature on key miR targets to treat skeletal, cardiac, and smooth muscle diseases and novel valuable clinical tools for more effective treatment strategies in muscle degeneration.